A hike in the park on a beautiful summer day can be made all the more enjoyable if you take your dog, your best pal, along for the trek! That way, you not only get to enjoy the experience through the eyes and ears of a human, but through the biological marvel that is the nose of a dog. As that amazing canine nose kicks into hyper-drive, your dog will alert you to things you would have never noticed otherwise. As you get ready for your adventure in the brilliant sun, you may rub some sunscreen on your nose. After all, you don't want to get sunburn or skin cancer, right? But... do you know that your dog's nose can get just as blistered by UV radiation as your own nose? It's true and it's a fact that many dog people don't seem to know. Read on because we're on a mission to educate people on this important topic of sunburn in dogs..
A dog's nose can very easily get sunburned. Not only that, it can get so blistered, it cracks and become very painful to the touch. That's the sort of misery none of us want to put our lovable pooch through! You should also know that your dog can actually get a sunburn all over his or her body, even in places where there's fur. This is because a portion of the UV radiation can penetrate straight through a dog's fur. In fact, the type of UV radiation that causes skin cancer in dogs and humans, UVA, is the type of UV radiation that can more easily penetrate fur. Furthermore, the fur on the ears, belly, and groin areas tends to be quite sparse, and therefore, these areas get sunburned more easily. ​What About Dark Long Haired Dogs? Light colored dogs and short haired dogs are the most susceptible to sunburn and skin cancer. However, all dogs, even dark long haired ones, are susceptible to sunburn, even through their fur, if the exposure is long enough and intense enough. It would be like you wearing a t-shirt outside for four hours and having your forearms be red as a boiled lobster and your upper arms scorched a lighter red by the UV rays that penetrated your t-shirt. Even though the t-shirt protected you some, both are bad! Both can cause skin cancer! Your goal should be to block as much UV radiation from you and your dog as possible. Can I Use Sunscreen On A Dog? 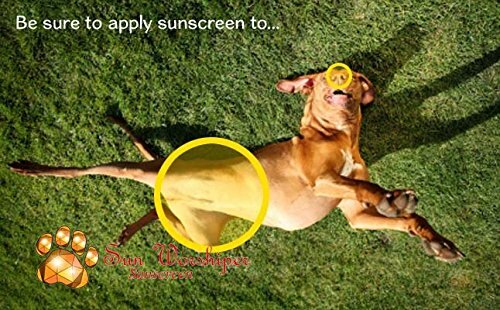 First, and most importantly, you should never use human sunscreen on a dog! There are ingredients in most human sunscreens that are highly toxic to dogs, especially zinc oxide. Dogs tend to lick themselves and you don't want these dog toxins to be digested in that process! What Kind Of Sunscreen Should You Use On Your Dog? Sunscreen for dogs comes in lotions, sprays, wipes, and sticks. Sunscreen lotions work best on areas where there is no fur or little fur and are most exposed. These areas include the nose, ears, belly, and groin. However, lotion does not work well in areas fully covered by fur. For these areas, sunscreen sprays for dogs work better. You can spray it quickly on the coat and then work it down to the skin with your fingers. Sunscreen wipes and sticks are convenient if you're just going on a short walk but they do not protect as well if you plan to spend significant time in the sun. What Is the Difference between Sunscreen and Sunblock For Dogs? You also need to know about the difference between sunscreen and sunblock for dogs (and people). Sunblock only protects against UVB, the type of UV radiation that causes sunburn. It does not protect against UVA, the type of UV radiation that penetrates more easily through fur and deeper into the skin and causes skin cancer in dogs. Thus, you want to always purchase sunscreen rather than sunblock. Some people use sunscreens developed for babies on their dog. While this is safer than regular sunscreen for people, sunscreens developed specifically for dogs is a safer choice for dogs. This way, you're not guessing about whether or not it's safe. For a dog's back, chest, and tummy, a better option than sunscreen is a sun shirt. If you get the right type of sun shirt, you can actually block more than ninety-eight percent of both types of UV radiation. 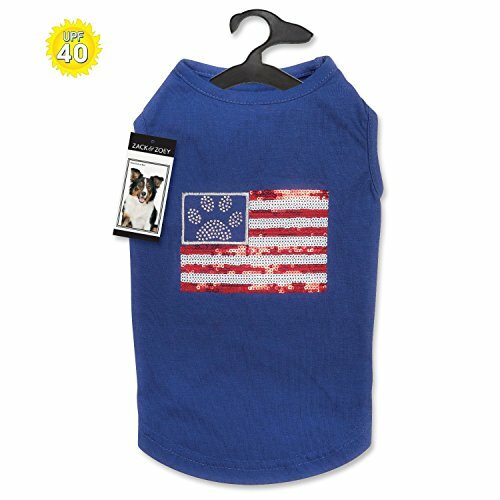 Sun shirts will also keep your dog much cooler on a hot sunny day. Some people like to wet them a bit to keep their dog even cooler. 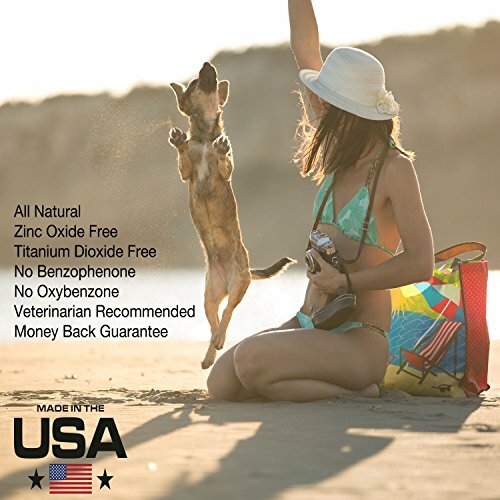 When shopping for a sun shirt for dogs, you want to look for ones with ARPANSA certification so you can be 100 percent sure the shirt delivers on the sun protection the marketing claims. ARPANSA is an acronym. It stands for Australian Radiation Protection and Nuclear Safety Agency. This governmental agency in Australia tests sun protective garments from all over the world and is considered the gold standard in this industry. The techniques they use to test the fabrics are based on science developed over many years. Manufacturers of sun protection clothing send fabric samples and other information about their product to ARPANSA for independent testing. Once the tests are done, a "UPF" (Ultraviolet Protection Factor) rating is given. The top rating is a UPF is UPF50+ which means that more than 98 percent of all UV radiation will be blocked! You will see this UPF50+ tag on the dog shirt to show it has been tested with ARPANSA and received the highest rating possible. This one comes in three colors and has an access hole to attach a harness. Really cute design for female dogs. It comes in pink and purple. 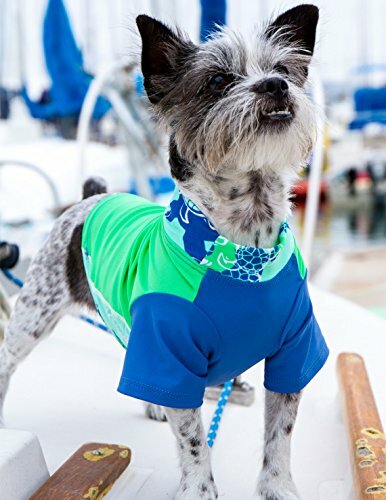 This is a UPF50+ PlayaPun dog sun shirt offered in several colors. 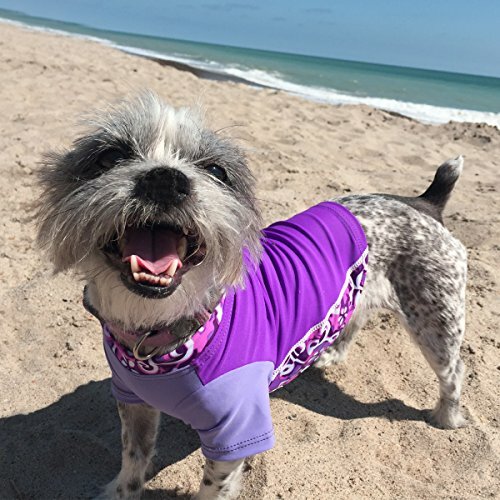 If you can't find a style you like in the UPF50+ sun shirts for dogs, you can try looking for UPF50, UPF45, and UPF40 sun protective shirts for dogs. However, we do not recommend you go any lower than UPF40, and still recommend UPF50+ dog shirts if you plan to be in the sun for more than an hour. 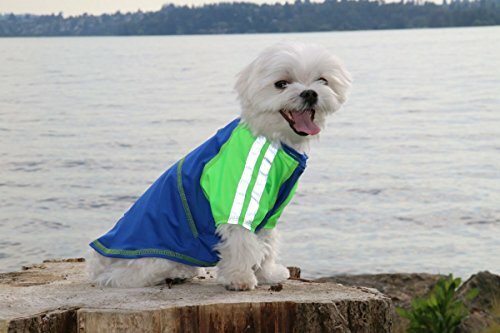 A dog sun shirt with a UPF40 rating will block about ninety-five percent of UV radiation. The UVA portion of UV radiation is strongest in the middle of the day. So, if you can avoid doing your dog walks and other sunny activities between about 10:00 AM to 3:00 PM, you'll avoid the harshest UVA radiation. Encourage your dog to lay in the shade, rather than full sun, whenever possible. If you put your dog on an outdoor run for fresh air and exercise, make sure there is a shady place he or she can relax. Look for shadier places to walk your dog such as a forest path or tree lined streets. If you didn't know your dog could get sunburned or that UV light could cause skin cancer in your dog, you are certainly not alone, so don't beat yourself up! Dog parents learn as we go. 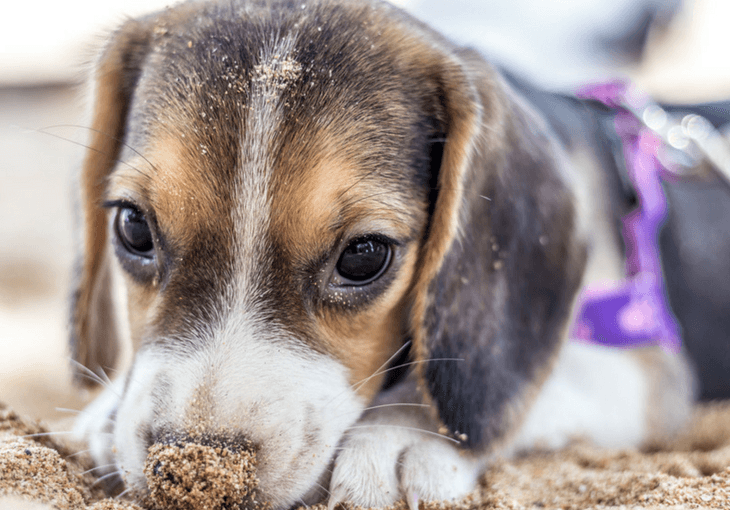 If you follow the practical tips provided in this article, you should be able to significantly cut down on the UV radiation your dog is exposed to going forward. In doing so, this will drastically lower the odds that your dog develops skin cancer and will prevent painful sunburn in dogs.